So, the next time you talk with someone and you think, I don't know how you do it, flip IDKHYDI on its head and make it a question: How do you do it? If they laugh nervously and say, "Me? Oh I'm fine..." wait for more. Let them know it's okay to talk about their fears, hopes, and dreams. I turn toward the woman in line behind me. 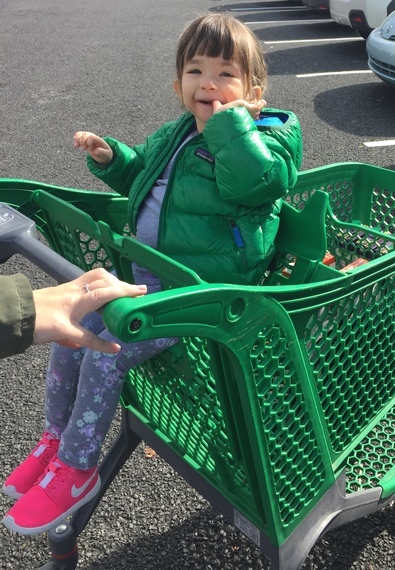 She is smiling at my daughter Esmé, who is sitting in the front of the grocery store shopping cart, slumped forward and to her left, leaning against my arm. Her free hand clicks against her teeth and she giggles at the sound of it. There is drool visibly dripping from her chin. Her tiny pink sneakers hang from her skinny legs, tapping restlessly against the cart. I take a deep breath and say, "This is Esmé. She is five." I see the lady sizing Esmé up, unable to hide her surprise. "Oh, hi Esmé," she says. And then, "She must be tired?" The woman seems kind, the line is long, and I am feeling talkative so I launch into my well-practiced friendly explanation that my daughter is not tired, actually, that she sits like that because she has low tone that results from her multiple rare genetic disorders. I tell her about our foundation. I give her my card. I answer her questions. I nod through stories about her grandchildren. And before I know it, I've made it through the check out--so Esmé and I say goodbye. The woman looks at us sweetly, and pronounces her parting words to us, "Good luck. I don't know how you do it." I don't know how you do it. These words ring like a chorus in my head. They are words repeated by friends, family, strangers, and medical professionals, who wonder out loud how I make life work with Esmé so frequently that I've shortened the saying to IDKHYDI (pronounced I.D.K. Heidi) for ease of communication. Here's the thing you might not guess: Hearing IDKHYDI all the time is, frankly, maddening. I know it is intended to be a comforting saying--an acknowledgement of how hard I work each day to keep Esmé safe, healthy, and happy. But what I feel from it is that the speakers are distancing themselves from me, from Esmé, from disability. It is an empty saying, much like God only gives special children to special parents, which rather than comfort does the work of saying, I certainly couldn't handle this, so it is a good thing it didn't happen to me! But the reality is that we are all, each of us, just one step away from disability altering our lives. And when it does, the world doesn't stop for you, so the way "you do it" is that you just do. At first, when Esmé was a tiny little baby and the extent of her medical issues were just becoming clear, I felt flattered when someone would IDKHYDI me. I would tell someone that Esmé had cardiac arrest at three months old and they would say, "Oh, my god, I don't know how you do it." I'd think, yeah, that sounds about right... We were still in the crisis mode. There was some kind of weak comfort in the acknowledgement that we were doing "the impossible." But soon I started feel something else lurking behind that comfort of pronunciation of my seemingly endless maternal self-sacrifice: a flash of unnamed anger. "I do it with a ton of help, focused hard work, zero down-time, eternal to-do lists, a colorful list of swear-words in two languages, Esmé-inspired determination...and coffee. Lots and lots of coffee. What about you? IDKHYDI." "Oh when they hand out the babies who are severely medically fragile they give you this handbook called How Life Works and a bottle of never-ending magic potion. I don't even have to read the book. I just sleep with it under my pillow. Handy, right?" However, with time, I have come to realize is that no one actually expects me to respond to IDKHYDI. Because, the thing about IDKHYDI is that it is punctuation. It says "I know enough now to make the following summation: IDKHYDI. So, moving on..."
In this way, IDKHYDI is a full-stop. This is a problem for me. My whole existence as Esmé's mother is oriented toward starting conversations about her, not closing them. My life is about demonstrating the intimate details of loving Esmé. It is also about showing that Esmé is, fundamentally, just a kid who plays and laughs and needs. That I am, fundamentally, just a mom--a woman who loves and dreams and hopes. I want to push so hard against what makes Esmé different so that everyone can see that we are all the same. IDKHYDI shuts that whole thing down. There are so many people who are struggling through things that feel impossible. And they, too, are just waiting for someone to give them a chance to open a conversation about what they are struggling through. So, the next time you talk with someone and you think, I don't know how you do it, flip IDKHYDI on its head and make it a question: How do you do it? And not in that head shaking rhetorical question kind of way of saying "How do you do it?" (which is an IDKHYDI by another name). Rather, ask in that true let's-talk-about-this kind of way, "Tell me, how do you do it? And how are you?" If they laugh nervously and say, "Me? Oh I'm fine..." wait for more. Let them know it's ok to talk--about their fears, hopes, and dreams. Let them know you will listen.